The William Secord Gallery is pleased to present the work of Christine Merrill, an internationally acclaimed artist, whose portraits of beloved pets have enriched the lives of collectors around the world. To coincide with Westminster Kennel Club Dog Show, this exhibition marks her fifteen-year anniversary with the gallery, and includes portraits of Cavalier King Charles Spaniels, Basset Hounds, and West Highland White Terriers, among others. Over thirty oils are included, each painted for this exhibition. Since 1975, Christine Merrill has specialized in the depiction of dogs, completing commissions for clients across America as well as in Europe and Japan. Her work has been represented by the William Secord Gallery since 1990, where she has had eight successful solo exhibitions. She also exhibited at The Isetan Gallery of Fine Arts in Tokyo and the Artis Group in Palm Beach, Florida. Born in Baltimore, Maryland, Christine developed a passion for painting animals at a very young age. When she was two, her mother put a pencil in her hand and she immediately started drawing animals. With dogs and horses as her first loves, she painted her first portrait of a dog at the age of five. Rather than pursue a conventional academic degree in the arts, she attended to the traditional Schuler School of Fine Art in Baltimore, where she studied for five years under the schools founder, Hans Schuler and his wife, Ann. Merrills work hangs in many private and public collections, including the American Kennel Club Museum of The Dog in Saint Louis, and Friends of Art and Preservation in Embassies. Her work is in the private collections of Brooke Astor, Barbara Taylor Bradford, Bunny du Pont, Bob Shieffer, Jack Lemon and Oprah Winfrey, as well as many others. 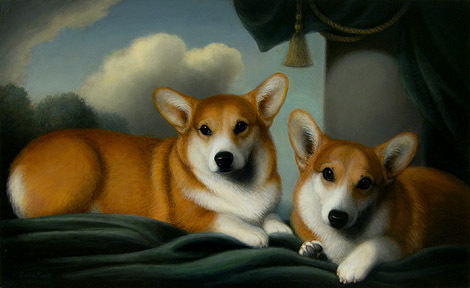 Christine Merrill is Americas most extraordinary painter of dog portraits. She captures in oils the love and understanding of our canine companions, members of our family who rarely disapprove, never disappoint, and always offers unconditional love. All images herein are the copyrighted property of Christine Merrill, and may not be reproduced without her express written permission.